The Latin American e-commerce giant is going places. There's no doubt that eBay (NASDAQ:EBAY) has been a phenomenal long-term investment. Shares of the online marketplace have risen more than 35-fold since its IPO in 1998. That return could have turned a moderate early investment into life-changing wealth. Unfortunately, eBay is no longer the go-go growth stock that it used to be. The endless competition from Amazon and Walmart have pulled the company's revenue growth rate down into the single digits, which makes it hard to get excited about it as an investment. 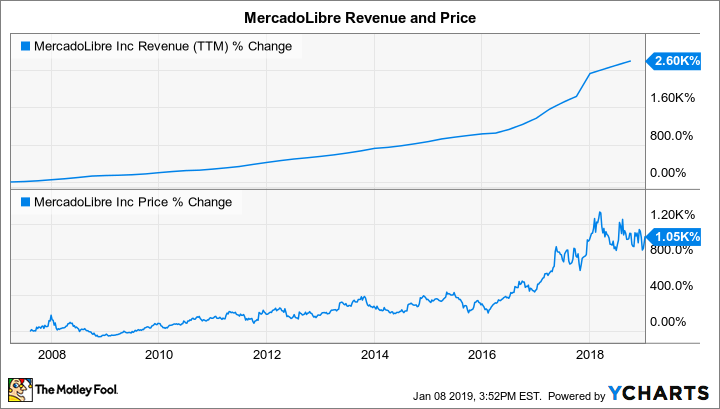 That's why I think that e-commerce investors should look south of the border and get to know MercadoLibre (NASDAQ:MELI) instead. Check out the latest MercadoLibre earnings call transcript. MercadoLibre isn't a well-known business among U.S. consumers, which is understandable: It operates an online marketplace that connects buyers and sellers across Latin America, which is why the investment community often calls it "the eBay of Latin American". MercadoLibre Marketplace: An eBay-like platform that connects buyers and sellers. MercadoEnvios: A wholly owned fulfillment network that handles package delivery. The company has invested aggressively in building out its infrastructure in recent years to control its shipping costs and also increase reliability. MercadoPago: A payment network that facilitates transactions on its sales platform and elsewhere, just like PayPal did for eBay. The company states that 82% of the transactions on its network use MercadoPago. Management is also in the process of rolling out an asset management product that will allow MercadoPago users to invest their balances. MercadoCredito: Offers merchants and consumers credit services to help them fund transactions. This is an important service because large shares of the population in its major markets lack access to traditional banks, and less than half of adults in the region have credit cards. These also sells classified ads, advertising, and provides online storefronts to some of its merchants. With all of these businesses under one roof, perhaps a better nickname for MercadoLibre would be "the eBay, Paypal, Amazon, and Craigslist of Latin America." MercadoLibre has grown like wildfire since it was founded in 1999, and it remains extraordinarily popular. That's important, since marketplaces naturally benefit from network effects. Buyers want to be on the platform with the most sellers, and vice versa. With more than 248 million registered users in 19 countries, there's no doubt that MercadoLibre is the top dog in its region. A swelling customer base and new product launches have helped MercadoLibre to drive consistent revenue growth for many years. Wall Street has applauded the gains by bidding up the share price, and hugely rewarding long-term shareholders. Since more than 635 million people live in its operating region, and internet penetration rates there remain relatively low, there's ample reason to believe that these numbers can continue to grow from here. MercadoLibre is currently trading for more than nine times sales, and it boasts a forward P/E ratio of 667. Those numbers might make a value investor's stomach churn, but they are a bit misleading. A combination of currency movements and recent revisions to U.S. accounting standards are masking the company's true growth numbers and profitability. Consider this: MercadoLibre generated a net loss of $102 million over the last 12 months, but it generated $130 million in free cash flow over the same time period. What's more, its reported revenue growth rate was "only" 17% under the new accounting standard, but 58% on a currency-neutral basis. That's why I prefer to look at the company's operating metrics to gauge its true growth rates -- and these numbers suggest that the platform is still growing like gangbusters. While I wouldn't argue for a second that MercadoLibre's stock is "cheap" right now, it is currently trading at a 20% discount from its recent high. Given the company's growth rates and prospects, I think this is a fine time for growth-focused investors to get in. I've been an investor in MercadoLibre for several years, and I can't help but feel excited about its long-term potential. That's why the stock currently comprises about 5% of my investment portfolio. With ample room to grow in its core markets and a strong competitive position, this is a company that I plan on holding for many years to come.